I haven't seen a thread like this and thought we all might enjoy seeing our trucks back when they were ALL daily drivers doing what they did and going where they went. Yes, all these photos are stolen from a vintage photos thread on the H.A.M.B. 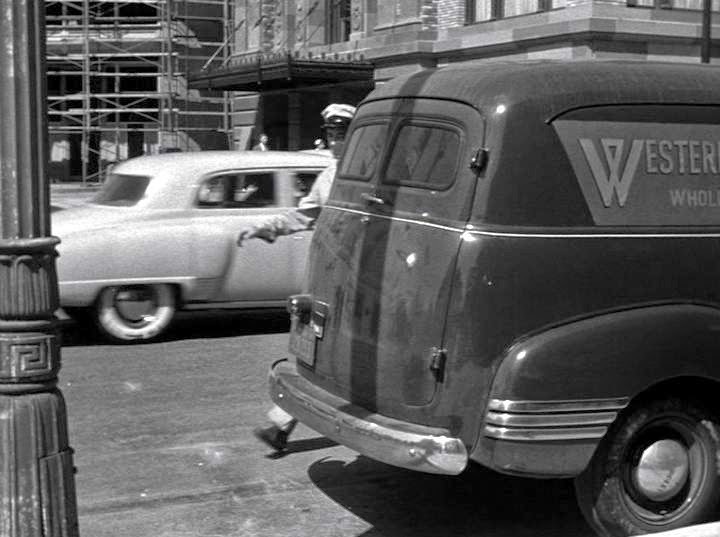 PS: Yes, I threw in one of the FIRST "AD" trucks - Art Deco design series. Dan's '55 Big Window "Build" - Well, Kinda! The line up in front of the dealership reminds me of the Hall-Harmon dealership here in town in the 50's. They were spread over several blocks on the other side of town and sold GMC trucks, Buicks and Pontiacs and had the International Harvester dealership for farm equipment and trucks in another building along with selling appliances alongside the farm Equipment. I had a chest freezer that my grand parents bought from them years ago. A day of deer hunting, about 1969, with my brother in law Moose, on the left and my brother Dave on the right. 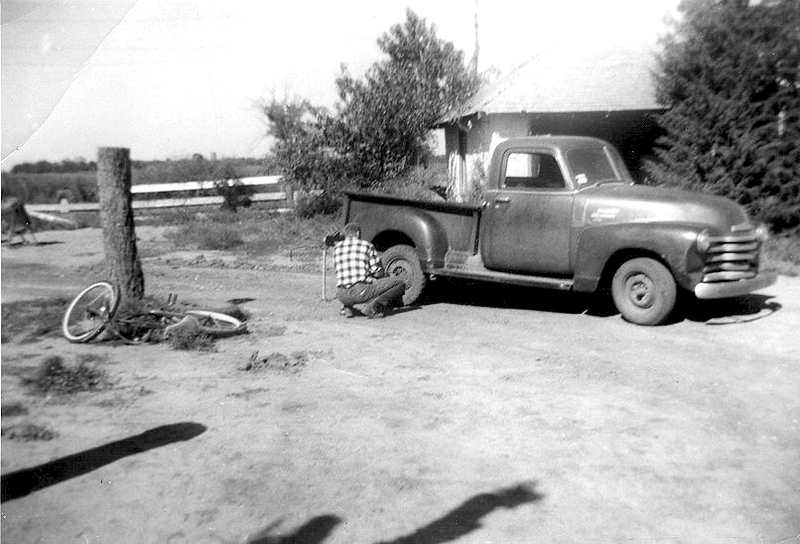 The skinny kid with the hair is me..... Bought the '64, with a blown rod, from a friend of my brothers for a few hundred and then got a junk yard six with 12,000 miles on it for $125. A couple of years later upgraded to a 327, so I could haul a cabover camper over the grapevine to the High Sierras. Pulled the engines and did all the work myself right there in the alley behind our apartment in Anaheim! '55 Chevy 1/2ton pickup w/ Pontiac 350 and Muncie M21 close ratio 4speed "Red Ryder"
That photo of the assembly line is something else. I love the "Traveleze" trailer. Took this about 15 years ago, when my 52 was my daily driver. I had just hauled this load of topsoil about 15 miles at 50 mph. There is no such thing as too much cam...just not enough engine. I love it Fred! Mine was originally a 3/4 ton too, and a farm truck, OMG I wish I had some photos of it out on the field! Very nostalgic pic. Doughnuts were only a nickel. Always amazed at the compact and finely fitted cabinetry in the back. 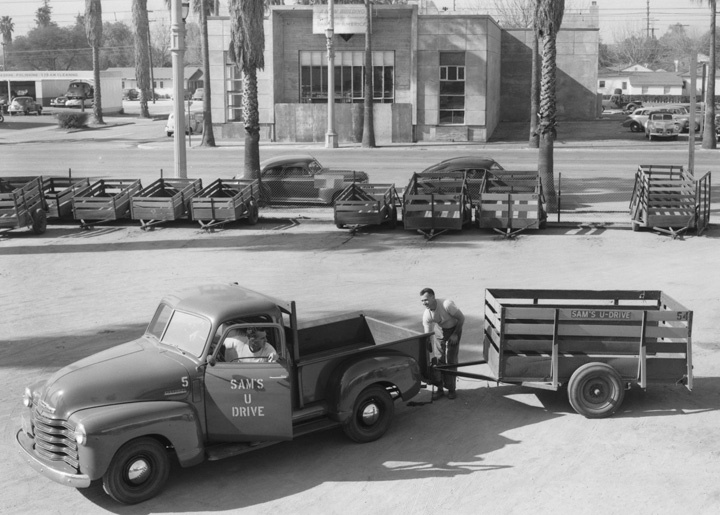 The Helms AD truck was a daily fixture in Pico Rivera in 1960s. Kids begged for a nickel and waited (almost like the ice cream truck). Now they would probably be robbed and murdered if they dared go there. I just thought it would be nostalgic to see our trucks when they were, well...just a truck. Mine will enjoy a retirement of being babied but then the condition of my bedsides and tailgate indicate it never worked too hard anyway - almost NO dents in them - amazing after 60+ years. Here's mine not too long ago.... Intentionally haven't finished the bed so I can still use it to haul stuff. Just because you can, doesn't necessarily mean you should. My grandfather had a 53 3600 truck that he used as a working truck until about 1992/1993. He hauled scrap steel to the salvage yard. I haven’t been able to find a pic in the family photo albums. I guess having the memory is better than any old picture. Some more. Yes, i realize there are illustrations, but I think they fit the theme. Last time I used mine prior to being garaged. I am going to print this out and put it on my wall, that is soo cool! If anyone knows of a bigger example throw it my way. That is so cool. Shows what the trucks did and how much people enjoyed having them as a tool. The AD trucks have a big place in building what we have today. The suburban pic brings back memories. Drove one from Ca to New York when i had to go there to enlist in the USAF. Myself and two other drove and lived out of it for several weeks on the long trip across the US . Poor thing had developed a rod knock after a cruise on Hollywood Blvd in early 1969. (the oil breather fell off and ran low on oil. 45 MPH was max speed before the knock scared the H out of us. I left it at my cousins place in Seneca Falls NY and understand it wound up as a farm feed bin somewhere near by. It had a surfboard on the roof and a black and white striped rear bumper. Doubt it survived but if seen or remembered drop me a line.